On May 17, 2014, Admiral William H. McRaven addressed the graduating class of the University of Texas at Austin on their Commencement day. Taking inspiration from the university's slogan, 'What starts here changes the world,' he shared the ten principles he learned during Navy Seal training that helped him overcome challenges not only in his training and long Naval career, but also throughout his life; and he explained how anyone can use these basic lessons to change themselves-and the world-for the better. 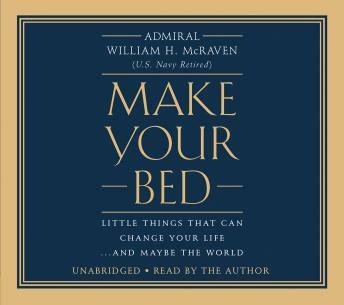 I liked this book especially as I had heard the Admiral’s UT speech. It expands on that. It contains a lot of great but simple advice for kids today! Amazing book! Very inspiring and very practical applications! It was an alright book but wasn't life changing.